This is one of my new favs! It’s pretty simple, fresh and SO good!!!!! I was googling recipes for what I had in my fridge – quinoa and goat cheese. I just happened to have orange and celery and cranberries as well. 🙂 I found this awesome dish on Knead For Food. This dish is gluten free, and I also added chicken for protein. You can eat it hot or cold, but I prefer to heat mine up a bit then add the goat cheese at the end if you’re eating it for leftovers. Gluten free, citrusy and wonderful!!! Ready – GO!!! 1. 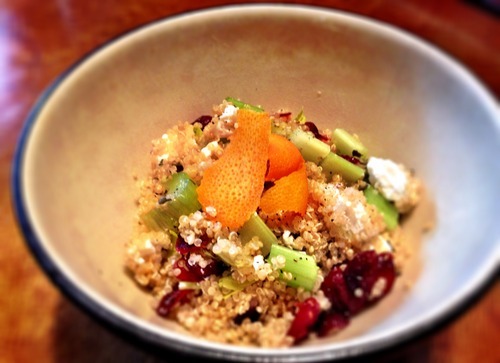 Peel the orange zest off and cooked the large strips with the quinoa and also used the juice to soak the cranberries. This technique worked well for flavor and then you get a neat little garnish out of the softened orange strips as well. For peeling the orange, use a vegetable peeler and don’t be afraid to put some force into it. The orange hates being peeled like this and will give you tiny pieces at a time if you don’t show it who’s boss. Make sure to peel away from your hand when using any significant pressure. 2. Juice the orange into a bowl with the cranberries to rehydrate them a bit. This will also pull some of the sugars out of the berries, which will combine nicely with the juice. 3. Heat 2 cups of lightly salted water to a boil and add your quinoa and orange zest strips. 4.Reduce to a low simmer, cover and let cook for about 12 minutes. When the water is completely absorbed, remove the orange zest and if you want you can julienne a few for a garnish. You’ll find that they are completely devoid of flavor at this point. 5. Combine the cranberries and juice into the warm quinoa, mix and let cool for about 15 minutes. Once cool, mix in the celery and basil and season to taste with salt and pepper. Add the chèvre and gently fold in. Garnish with a bit more basil, goat cheese and the julienned orange zest for fanciness and serve.